I always read completely through menus to make sure both of us would enjoy a place, so I knew going in I was getting the Corned Beef Hash. 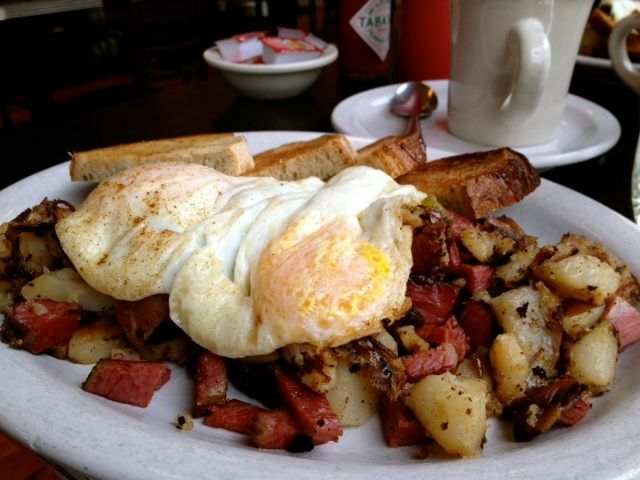 My husband quickly saw the Pastrami Hash. And to be honest having not been here I wasn’t completely sure what the specialty was. But it’s pretty easy to figure out when you look up at the sandwich board and #1 on the list is Pastrami. I told my husband he needed to order it. The gal came over right away and asked what we were thinking. Of course we asked what the speciality was and she said Pastrami and Corned Beef. Cured 7 days, Smoked 10 hours, Steamed for 3 hours & Hand-sliced Just for You. Sweet!! Seriously not sure why I wrote this place off so quickly. The hashes came out quickly. They both had huge chunks of meat. They looked exactly the same, but tasted much different. Wow, not sure which one I liked better. I was over halfway through when I finally looked up to see that every table but ours had spicy mustard. I quickly grabbed it and added some and wish I would have found that sooner. UPDATE:: Return visit for dinner. 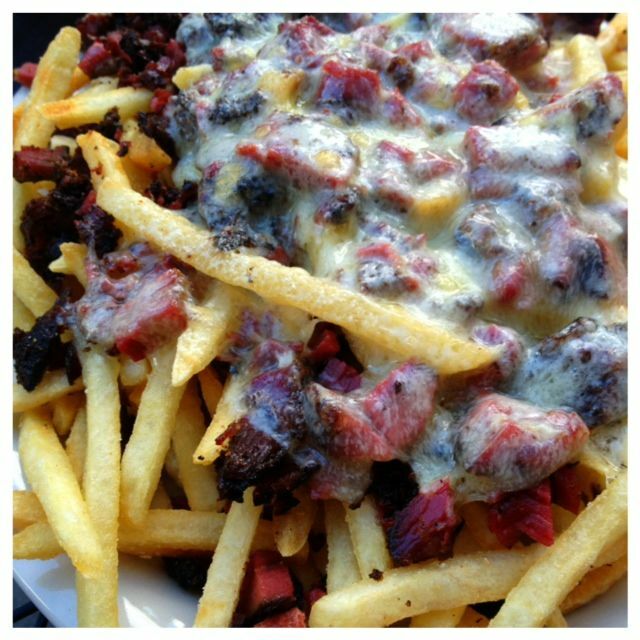 As I was checking over the menu I saw Pastrami Cheese fries. I mean seriously, how do you turn that down? I should start by saying that Kenny & Zukes has great fries, and we all know they are known for their pastrami, so this dish was a huge hit at our table. It was completely loaded down with pastrami, and surprisingly not heavy on the cheese. Pastrami Burger. It was a good as it looks. Keeping with the Pastrami theme, we also ordered the Pastrami Burger. For some reason I thought it was going to be only pastrami, I don’t know why, but it wasn’t. 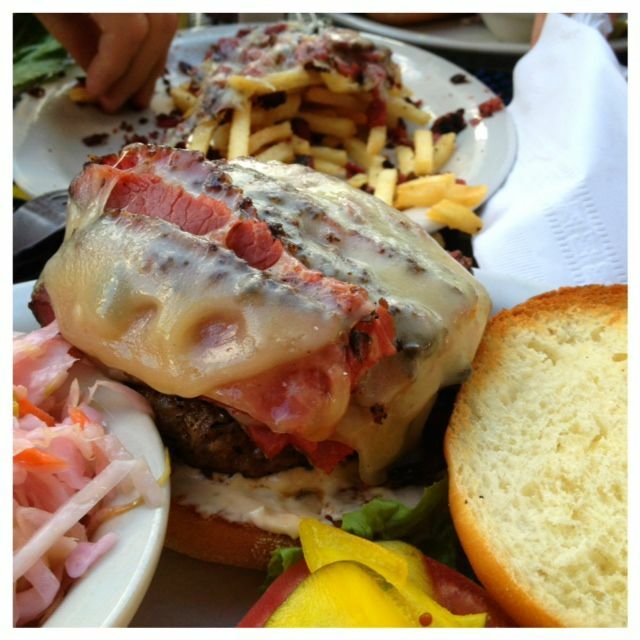 It was actually a good burger topped with their house made pastrami. Great burger! Our friends got the hot dog. I’m assuming it was good since I didn’t get a bite and there was nothing left on his plate. Atmosphere was very bright and open even on the gray day. Tons of windows. They have a walk up counter for take out and a dinning area to be seated to stay awhile. Service was awesome! My tea water was hot the whole entire time. That says something because tea drinkers always have cool drinks, the coffee drinkers always have priority there. They had Steven Smith tea, which I do like. The beer selection is ridiculously big. I have a coupon in my Chinook Book for dinner, so we will be going back to enjoy some more food and good beer. Pricing was a bit on the high side for the hashes, but it was so good and a very large serving, so no complaints. Kenny & Zukes is a favorite. Check out more of my favorites.